and still do as it hangs on my wall in my soap room. bath - but so far they have floated halfway around the world. from a cargo ship 15 years ago. sank, landing in Hawaii and even spending years frozen in an Arctic ice pack. expected to be spotted on beaches in South-West England. their adventures at sea have proved an invaluable aid to science. to the authorities than the floats which scientists normally use. have been able to survive years adrift at the mercy of the elements. will turn up on English beaches. "Cornwall and the South-West will probably get the first wave of them." made in China, packed into a container and put on a ship for the US. up on the Alaskan shore, then all down the West coast of Canada and the US. frozen and then thawed out on the eastern seaboard of the U.S. and Canada. travel slowly across the pole, moving ever eastward. 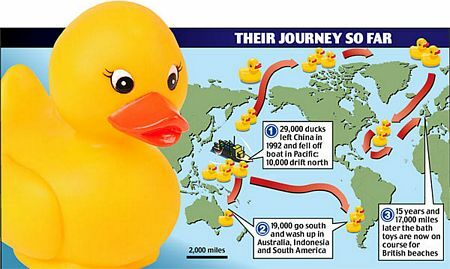 prepare for an invasion of the wayward ducks as well. story to please let us know. beachcombing do not attempt to pick it up! appear; they are no longer gentle and lovable bathtub friends. now and should be admired from afar”.